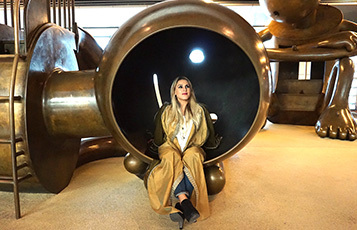 DOHA, Qatar, 2017-Mar-22 — /Travel PR News/ — Qatar Airways today named artist Dana Al Fardan, globally renowned composer and artist, as the official composer for Qatar Airways Group. This recognition caps a series of highly successful engagements, including the composition and 2016 performance of The Beginning for Hamad International Airport, its official theme song. Ms. Al Fardan is the founder and CEO of DNA Records, Qatar’s first recording company. Her first album, Paint, was released in 2013. Qatar Airways, the national carrier of the State of Qatar is celebrating 20 years of Going Places Together with travellers across its more than 150 business and leisure destinations. The world’s fast growing airline will add a number of exciting new destinations to its growing network in 2017, including Auckland, Chiang Mai, Dublin, Nice, Skopje and many more, flying passengers on board its modern fleet of 195 aircraft. Qatar Airways proudly supports a range of exciting international and local initiatives dedicated to enriching the global community that it serves. Qatar Airways sponsors world-leading sports teams including FC Barcelona and Al-Ahli Saudi Arabia FC reflecting the values of sports as a means of bringing people together, something at the core of the airline’s own brand message – Going Places Together. Visit our homepage www.qatarairways.com or our sites on Facebook, Twitter, Google+, Instagram, and YouTube. This entry was posted in Airlines, Entertainment, Travel, Travel Management and tagged Dana Al Fardan, His Excellency Mr. Akbar Al Baker, Qatar Airways Group, Salam Al Shawa. Bookmark the permalink.